Foo Fighters have been celebrating their 20th anniversary this year. They did so by putting out a new album, Sonic Highways, which coincided with their HBO documentary series and they have just announced their 2015 North American tour. In an ever-changing music industry dominated by pop they continue to inspire and push out successful rock albums. Their 11 Grammys must be rewarding but insignificant compared to their pure love and joy they have for music, which is why they continue to stick around an industry that favors everything young and new. Awards and record sales seem to show no effect on the band; above everything else they are just a group of friends who like to jam out. When you have a group of friends who genuinely enjoy each others company, that’s when people can start having pure fun. 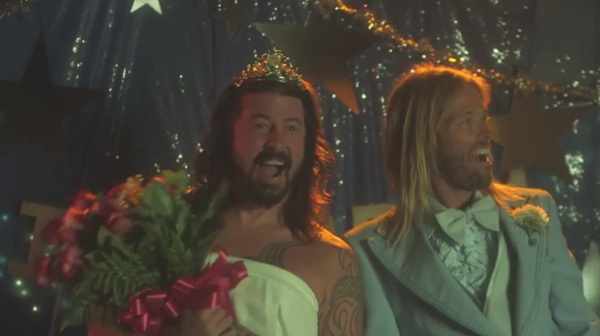 Foo Fighters prove just how fun being in band can be. It shows in their shared passion for music as well as their keen minds for comedy. I’ve assembled some music videos of the many times Foo Fighters used comedy to accompany a great song, and why I can say that they are one of my favorite bands and some of the coolest guys I look up to.